Our guest for today, Amie Irene Winters, author of bestselling novels, Strange Luck, and Nightmare Birds. Amie, congratulations on becoming an Amazon Bestseller! If you had one word of advice for struggling writers, what would it be? Thank you! It was a long-time goal of mine and it feels very strange now that it’s finally happened. Don’t ever give up writing! It’s okay to take breaks from your book. It’s normal to feel burned out. It’s normal to be upset if you get a rejection or bad review. The good news is that it does get easier with time and experience. At the end of the day the most important thing is focusing on your craft. Don’t be afraid to experiment. 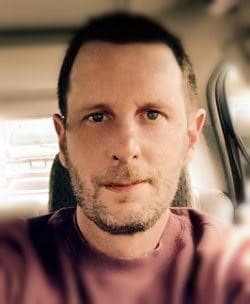 Every author and book is unique, so one type of marketing technique might work for one author, but not another. It’s all trial and error. Just don’t get too caught up in the marketing and repeatedly changing things. Writing a stellar book should be your number one priority. 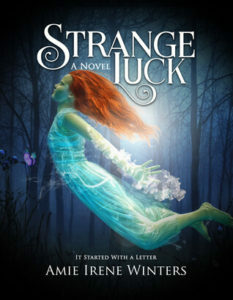 I was privileged to recently read Strange Luck, a fun, truly unique and original tale. What I found the most striking was the Darling shop for haunted “junk.” There has to be a real-life story behind this idea. Please tell! I’m so glad you enjoyed Strange Luck! Yes, there is a real-life story behind it. That being…I love to antique! My antiquing addiction started when I was a little girl and my parents would take me to garage sales and antique fairs. Oh, the wondrous things I would see and learn! Each object was a unique piece of history, and sometimes the story was more intriguing than the actual antique. A lot of the antiques in the Strange Luck shop were inspired by real things I’ve seen or read about over the years. For example, the fortune-telling cricket is real! Well, sort of. Growing up, my parents had a little cricket statue in our living room. When I got older, I asked where it had come from and my mom told me it was given to her by my great grandma who said it would bring their home good luck. I always thought that was neat, so when it came time for me to live in a house of my own, my mom gave me the cricket. Since then, it’s traveled across the country with me and it currently resides in my living room. – Fascinating! 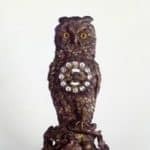 Being a lover of owls, I especially like the owl clock. Yes, it was certainly a leap, but the experience has definitely influenced my writing. They say to “write what you know”. Since I’m an outdoorsy girl, I found it easy for my protagonist to be one, too. Daisy’s a bit of a tomboy who loves hiking and camping. The trails she hikes and places she goes are based on some of my favorite real-life places in California. With that in mind, do you ever write outside? And if so, do you have a favorite place to write? Not really. I’ve found it difficult to find a good spot that isn’t distracting. I also primarily work on my laptop, so I’m always battling with the glare from the sun. Occasionally I’ll write ideas in my notebook outside, but that’s only during the beginning stages of drafting a book. I believe you’ve written a sequel to Strange Luck, “The Nightmare Birds.” The description on your website looks enticing. What can you tell us about the book and where do you see your series going from here? Yes. There are three books planned in the Strange Luck series. In Book I, Strange Luck, eighteen-year-old Daisy Darling uncovers a world built using stolen memories. It is in this world that Daisy discovers that she possesses unexplainable and unique abilities that she uses to battle the dark forces at play. 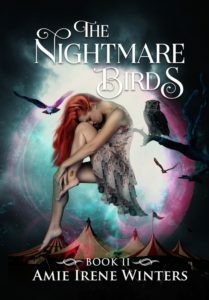 Book II, The Nightmare Birds, flashes forward to Daisy at twenty-one-years-old and uncovers more of her strange abilities and how they tie in to her heritage. In the process, Daisy uncovers the truth about the mysterious Theater of Secrets – long thought a dark legend by many, but known as a frightening reality to those who truly know its powers. As Daisy assumes her new role as ringleader, she not only discovers a surprising connection between herself and the previous ringleader, but also the haunting truth behind the theater’s limitless power. I’m working on Book III, A Darling Secret, right now. It’s expected to be released in winter 2017. You can sign up for my newsletter here to be notified about new book releases and special promos. Amie, thanks so much for joining us today. It was truly a pleasure, and best of luck with your writing. I look forward to reading Nightmare Birds. Such an amazing cover! And to my readers, thanks so much for joining us here on “Please Welcome!” Again, our guest today was Author Amie Irene Winters. 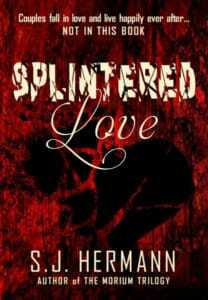 Her books are available in both ebook and paperback format. Check out “Strange Luck” you’ll be glad you did! 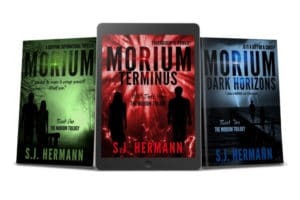 Our guest next time on “Please Welcome!” will be SJ Hermann, author of the Morium Trilogy and my personal favorite, Splintered Love.